St. George’s Organ needs 732 pipes to be complete. To learn more, click here. St. George’s pipe organ, designed and built by Parsons Pipe Organ Builders of Canandaigua, NY is their largest and most complex instrument to date. The organ façade is designed in the mid-19th Century Italianate style in keeping with the historic 1849 church building. The façade design was a collaborative effort between Parsons, Jim Wollon, historic preservation architect from the Baltimore area, and Dan Cole of PipeShader. The organ sits majestically in the rear balcony with choir seating on tiered risers to the front and sides of the case. It accompanied worship for the first time in December of 2010. The 2,667 pipes are controlled from three mechanical action keyboards and one pedalboard – Great, Swell, Positive and Pedal – and range in length from ½” resonators to 16’. The stop list is designed to create a worship instrument with a broad tonal and dynamic range. The console is walnut and blood wood with accents of wenge wood and incorporates state of the art digital technology with 200 levels of combination action memory. St. George’s pipe organ represents years of prayerful study, planning and sacrifice, and will serve the congregation and community for many generations. The nationally syndicated program of organ music, hosted by Michael Barone, featured Parsons Opus 29 and other newly built instruments in a program titled “Going Organic.” (Program #1318) The complete program is available on the Pipedreams web site.Organist Mark Laubach made this recording for Parsons in 2011. 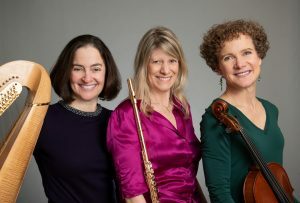 Michelle Myers Lundy (harp), Carole Bean (flute, alto flute and bass flute), and Ruth Wicker Schaaf (viola), of Beau Soir Ensemble will perform a free concert at St. George’s Episcopal Church. The concert is free with donations accepted at the door. For more information, contact (540) 373-4133 or via email. To learn more about St. George’s concert series, visit www.stgeorgesepiscopal.net/music/concerts. 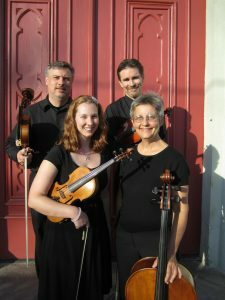 The Fredericksburg String Quartet will perform a concert at St. George’s Episcopal Church on Sunday, March 17 at 3 pm. The concert is part of St. George’s Chamber Series and will include works by Mozart, Hensel, Mendelsohn, and more. Admission is free with donations accepted at the door. For more information, contact (540) 373-4133 or via email. To learn more about St. George’s concert series, visit www.stgeorgesepiscopal.net/music/concerts.